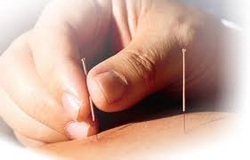 Acupuncture Treatment: For millennia, acupuncture treatment has been used to achieve health and wellness. Acupuncture stimulates the neuro-chemical reactions in the body by increasing and balancing the flow of Qi and Xue (Energy and Blood) through distinct meridian or pathways that cover the body somewhat like nerves and blood vessels do. The result is the dissolution of stagnation and the relieving of pain. There is a saying "there is no pain if there is free flow; if there is pain, there is no free flow." Our acupuncture and acupressure techniques can help you relax and relieve bodily discomfort. By diagnosing which of the 8 different constitutional types your body falls into, we can guide you towards feeling better. Our treatment can help with: Pain Control, Sports Injury, Car Accident, High Blood Pressure, Diabetes, Sciatica, Arthritis, Allergies/Sinusitis, PMS, Chronic Fatigue Syndrome, Infertility, Impotence, Bell's Palsy, Stroke, Fibromyalgia, Trigeminal Neuralgia, Indigestion, Herpes/Shingles, Psoriasis, Rash/Hives, Gout, Stop Smoking, Drug/Alcohol Addictions. In addition, acupuncture has been successful in treating acute and chronic pain where conventional drug therapy has failed.